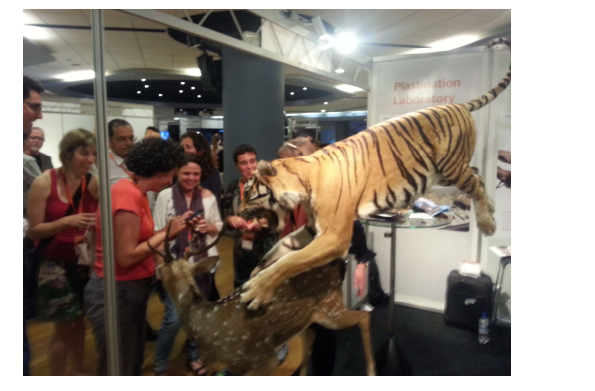 This was my first Ecsite conference, the European network of science centres and museums. I had a number of reasons to be there, primarily I wanted to see the latest in interactive technologies and understand how the maker movement is developing in Europe and also to catch up with my friends at colleagues at Euromax who were holding a concurrent giant screen event in the wonderful Omniversum dome right next door to the World Forum convention centre in the Hague. certainly peaceful, not even a crossed word, and through the conference sessions it became clear how important science is to help to educate and share the critical issues that will affect humankind as we propel ourselves forward in this 21st century. As you can see from the photo, Ecsite was well attended. It was also well organised and fully scheduled. 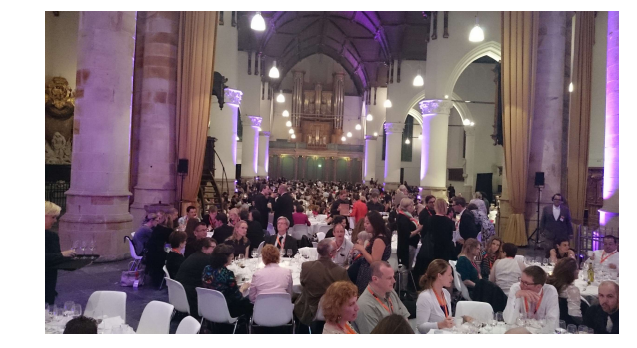 This is the gala dinner held at De Grote Church (the big church), which as you can see is aptly, if not imaginatively, named. Unlike a few events I’ve been to recently there was a good balance between customers and vendors. I don’t know the figures but I’d guess at least a 2:1 ratio (customers to vendors). I expect that the comprehensive conference schedule was the driving factor. The customer to vendor ratio at Euromax was the inverse, with only seven theaters attending the conference vs a bevy of film producers, distributors and one or two hardware vendors circling around. NEC presented their laser projector to a generally enthusiastic response. It covered only the front portion of the dome but was calibrated to show a wider colour gamut (richer colours) than is possible with lamp based projectors which pointed the way for what we might expect when we can see an entire dome illuminated with laser light – should be very nice! IMAX are saying that their laser dome solution will be available late 2015 early 2016, others can, and probably will, get there sooner. Mindful of the customer to vendor disparity, the wise folk at Euromax had deliberately timed their event so that they could host a morning breakfast screening where Ecsite attendees could witness a taster of the giant screen library of films. This proved to be a successful move with around 50 additional people joining the screenings. It was a slick event, the films look great on screen and the response was positive. These giant screens need no longer rely on cumbersome expensive film projectors to deliver the experience. The wide range of digital projectors and the competitive landscape means that theatres large and small can enjoy these 20 or 40 minute documentary films (yes, they’re still called films even in a digital format). I learned many things from this Interactive panel session. Firstly about Pecha Kucha which I’ll now employ often, and secondly that interactive doesn’t mean what I though it meant. I was expecting, hoping, to learn about the latest interactive exhibits (which for me means ‘using the latest interactive technology’) and how to make deploying this latest technology successful. In this session, the expert panel talked mainly about mechanical devices, levers, big buttons, cogs, thing you hit, push, pull, touch, feel. And of course they are interactive. And what we learned were a series of valuable truisms that could be applied to any exhibit, no matter how tech’d up it is, or isn’t. Keep it simple, make it obvious (intuitive), make it safe (!! ), provide guidance, make it fun. And for me the most important message, make it social, a subject I’ll come back to later. I liked Robothespian. He’s fun. I must have spent at least 30 minutes talking with him and his colleagues at Engineered Arts. He’s not new, he’s eight years old and around 50 of his brothers can be found in science centres, museums and universities, talking, having fun and teaching with kids and students around the world. What I liked about him was that I couldn’t stop calling him ‘him’. I tried calling him ‘it’ a few times because I was quite certain he wasn’t sentient, but it didn’t feel right. It felt impolite! Robots will be among us, in our daily lives. Our children will grow up with them. Robothespian is a fantastic way to teach the mechanics, the software and the media that will make a great interactive robot. Surely all disciplines that a science centre should be addressing. The biggest take away for me was that he was a ‘he’, I can’t even start to describe, in these 20 seconds, the social impact that will have for all of us. But I can in these! 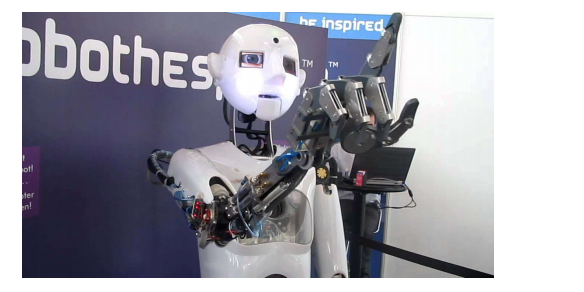 (at least make a start)… There were a few other video examples of robot exhibits at the conference. The two I saw were only head and shoulder exhibits and were designed to mimic human facial expressions. One was a little spooky, a digitally projected face inside a model of a human head. With sophisticated algorithms it was able to recreate all facial expressions, but what I learned was that being too human, without being human, is a step too far. Unnervingly unnatural and therefore unappealing. We will have to learn how to integrate robots into society in ways that make them attractive and engaging (while the military work on the other types). Robothespian should be the template, maybe they should rename him Adam. Not a lot going on here. Which was very disappointing. We all know that there’s so much data, and that good data visualisation can bring about step changes in the comprehension of a subject. So why was there so little of it, and so little being discussed? Our kids will need to know how to interpret their new data universe, the virtual stuff as well as the real stuff. C’mon science centres, get scientific! I’m possibly being unfair in point 9. There’s probably more out there than can be shown on a 6 x 6 booth. For those that know me you’ll know I have a place in my heart for planetariums. Not so much the pre-21st century types, instead the modern (hi-tech) ones, the ones that can take audiences on digital explorations of the universe, all of it! To the edge of the known universe and to the smallest particle, and anywhere in between. These are data visualisation theatres not just for astronomy. Sky-Skan had a nice booth as did Skypoint but they still looked very star centric, which for me, was a shame, a missed opportunity. There were a couple of interactive tables, again I was expecting more. The star of the interactive and data visualisation show was this Inside Explorer Virtual Autopsy Table. David Hughes (a well- known data vis celebrity from the days of Silicon Graphics) showed what can be done when you do it well. 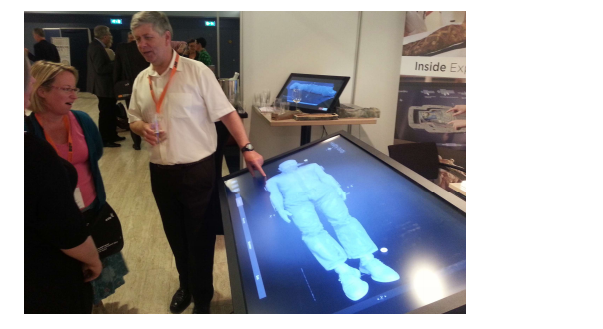 His interactive table has a series of digital models. One example was a man who had volunteered to be full-body-scanned. His data was then presented on the table, and in a smooth and intuitive way he could be sliced, rotated and revealed in all manner of ways (skeleton only, organs only, etc). Our volunteer could hide nothing, literally nothing! As an exhibit it was easy to use, intuitive and engaging. David always had a crowd. It was a great example of how to make something that is actually very complex appear as simple and easy to use as an iPhone. Like data visualisation and interactivity I was hoping for more than I saw. This was possibly my fault as I was only able to attend one session on games. However there was very little talk of games outside the sessions and nothing to see on the exhibit floor. I did attend a fun workshop where we sat in four groups of five or so, and a team of presenters would visit each table to explain their game project for 10 minutes and then rotate round each table. At the end each group had to invent a game, describe its goal, objectives and gameplay. Now there’s only so much one can learn about a game in 10 minutes and it’s hard to create a good one in 20. What I did learn were three things, in the context of science centres the games should be social; group learning and all that. Also that it’s quite easy to conceive a game about any subject; a termite game can be a great shoot-‘em-up experience and an informal way to learn about termites at the same time, and finally that the big challenge is to create a game on a science centre budget that can compete with the experience one can get at home! Don’t beat ‘em, join ‘em I’d say (i.e. take a popular game and create a science learning derivative). cheaper). The message here is that this technology is in the hands of the kids, they’ll buy them and do all sorts with them. How can science centres stay ahead of that or at least add value so that there’s a reason to go to one? Charlie Morrow was using the Oculus demo to present his spatialised sounds system. What was even more effective was the demo he showed in the Omniversum lobby. With an array of eight small self-powered loudspeakers and a sub, Charlie showed that by placing speakers at floor and ceiling level (four at each) the space within could be transformed into, well whatever you choose. A well recorded forest scene had us among the trees and a river with bird song all around. It was very effective for what was low cost hardware. Trains and motorbikes were used to demonstrate that the sound field could be extended way into the distance. There are a lot of developments in the world of spatialised sound. 5.1, 7.1, et al will become a thing of the past. If you’re not familiar with the maker movement I recommend you find some time to look it up, or even attend. This is a movement, a rolling stone. And like Mick and the boys it’s got quite a following. 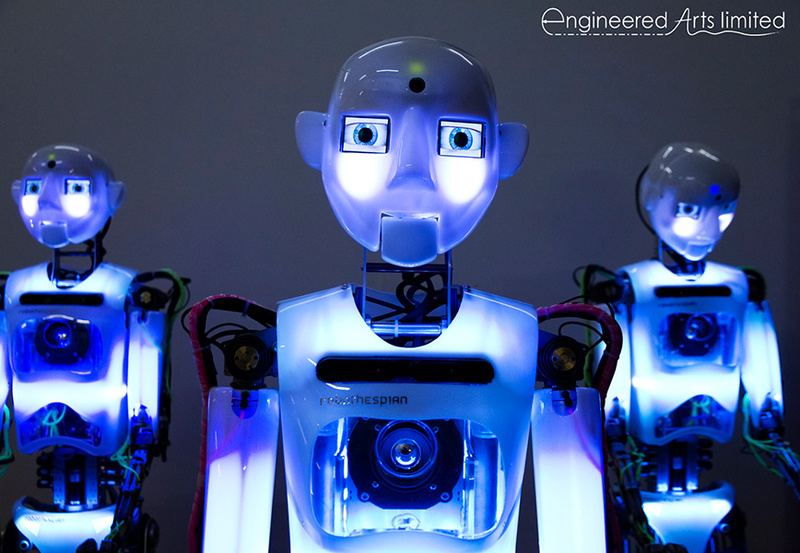 A network of millions of people who DIY with tech; robots, 3D printers, drones, wearable technology and the like. All home-built with kits for sale or from deconstructed washing machines and things. Maker events and festivals are growing rapidly. A maker workshop session explained that when Centre for Life in Newcastle started the UK fair, their first Maker Faire (a brand that licences fairs) had a couple of thousand attendees, in one weekend. The next year they had 5,000. The following 10,000 (which fills their facility so they can take no more). The US flagship event in San Mateo California projected an attendance of 120,000 this year. What a great reason to host an event at your science museum. A common theme throughout the conference was the importance of social learning. Being together with other like-minded people, or non-like-minded, to explore and discover. A shared experience is richer, it stays longer in the mind and can be replayed from many viewpoints. Science centres, museums and their exhibits are, and should be, social places for groups of people to discover together. There were many great examples of this throughout the conference. They clearly get it (and judging by this photo they’re not afraid to get close to the action!). Maybe it’s because they get it that the event was so successful. When your job is all about sharing what you know then it’s not surprising that when a few hundred people in the field get together they do a great job of sharing what they know. In one session discussing how to arrange a maker event, one of the presenters volunteered to set up a discussion forum, and he did, right there and then, they were able to continue to share straight away using social networking tools. and maturing technologies take hold. Robothespian reminded me of that. Those of us who experienced the transformation that computers brought about in the workplace during the ‘80’s probably understand how this decade is being impacted and which technologies might be commonplace by 2020. I was disappointed by the lack of visible hi-tech on the exhibit floor, but I was encouraged that science centres and museums clearly understand their role. Our kids will have access to all of the information but they will need to be inspired to turn that into valuable knowledge and meaningful action. I hope that science centres embrace these technologies rapidly yet appropriately, after all they will be able to move far swifter than the schools. It would be remiss of me not to report on the theme of the conference, so I made a point of attending a session of the same name. This is the big picture. We, humans, share common challenges. From preventing the development and deployment of chemical weapons through to dealing with the impact of climate change. Science is the tool we use to explore, discover, test and develop solutions to these challenges. So we need scientists and for that we need our kids to be interested in science. And that just takes a spark, something to ignite their interest. Creating that spark, as I understand, is the role of the science centre. This conference and conferences like these are for science centre people to discuss and debate how to continually generate that spark. What better reason to attend?